The new Nissan Leaf Hatchback is one of the most popular EV’s on the market. It’s comfortable, refined, remarkably cheap to run, and is a solid family car for environmentally-conscious drivers who want as much quality as a regular hatchback. The Leaf is well into its fifth year. Some of its rivals can offer more performance and style, but the Leaf has more range and doesn’t cost as much to buy outright. The first mass-produced EV ever sold here in Britain, it’s not all that dissimilar to drive than a regular petrol or diesel car, and feels right at home in the town. It’s just another hatchback – but greener. 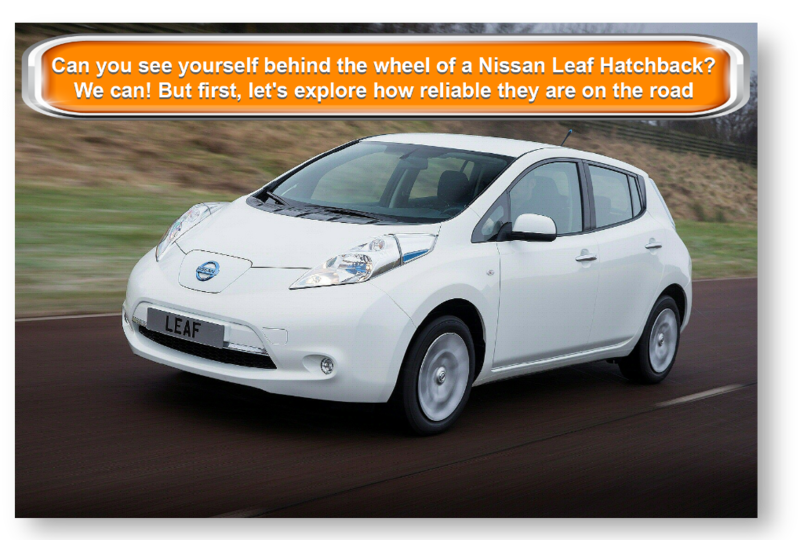 OSV takes a closer look at what it’s all about with our Nissan Leaf Hatchback review. The car is comfortable on the move and makes very little noise, with the electric motor emitting a faint hum as you amble around the town. But while this is good for cabin refinement, you’ll find that it’s easy to creep up on unwitting passengers who are surprised to see you! At times, it’s so ghostly quiet that if you take it somewhere remote, you’ll hear every crack in the road. On the open road, the absence of engine noise comes without any such hassle at all. Thanks to a softer suspension setup, the Nissan Leaf is able to absorb some of our worst lumps and bumps, but it doesn’t inspire a lot of confidence when you’re driving down twisting roads. The overly light steering doesn’t help matters in this regard. In the town, however, the car copes just fine, where it’s very easy to drive, and feels no different to a conventional hatchback. Starting it up is as simple as using your gear selector to choose the “D” option, before pulling silently away. The electric motor is capable of generating up to 108bhp, which it summons immediately. As a result, it can power you from rest to 62mph in 11.5 seconds. This amount of shove on tap makes the car perfect for inner-city traffic jams that are all stop-start. It comes with a 30kWh battery, which offers good performance and improved range. This car made its debut in 2010, and it looked different to anything that had come before. It looked like the future, not just of EV’s, but of hatchbacks in general. But it’s now become so familiar that it looks almost like just another hatchback. This perception is even worse if you parked one up next to a BMW i3 which looks very futuristic. However, it still looks smart, and sculpted headlamps and other assorted touches help to distinguish it from “regular” hatchbacks. The interior, however, could really benefit from a makeover. The LCD display is a bit blocky for our liking and looks dated, while the centrally-mounted infotainment touchscreen displays graphics that scream “2010”. However, we like the domed gear lever, which is very distinctive, while the metallic blue trim is a highlight. It lacks the quality or premium appeal of the BMW, but the cabin is well built, well appointed and made to last. Moreover, the dash comes covered in gloss black trim, which certainly gives things a boost. Nissan has made a lot of noise about the fact that the new car can do 124 miles before recharging, but you’ll struggle to reach that magic number unless you’re forever stuck in “eco” mode. It’s not the most fun driving mode. Moreover, to get a full charge you have to wait for eight hours from a standard household socket, although special charging stations can charge the battery up to 80% in just thirty minutes. There is enough space to sit four adults in relative comfort, with leg and headroom being especially impressive. The glovebox is reasonably sized, and the door pockets can each accommodate a bottle of water. The boot, meanwhile, measures a very respectable 370-litres, making it bigger than what a lot of conventional hatchbacks can offer, including the Ford Focus. It comes with a rather high lip, though, but it is very deep. The rear seats don’t fold completely flat. Standard equipment is good across the range. 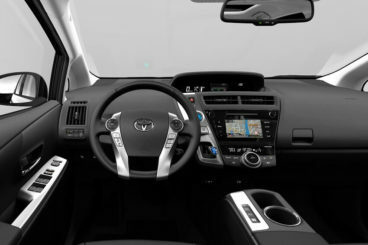 The most basic model gets the likes of electric door windows and mirrors, air conditioning and Bluetooth Connectivity, but if you want a rear parking camera and the infotainment system, you’ll need to shell out a bit extra on the Visia+ trim. The Acenta model is the pick of the range and adds a 7” colour screen, automatic lights and wipers, cruise control, and a very useful onboard charger. You also get some rather smashing 17” alloys that come with a blue finish. Prices for the new car start out from £26,000 and rise to almost £32,000. If you prefer to lease, you can pick up a deal from as little as £159 + VAT per month. For more information on our leasing deals, you can check out our page here. As you might already have guessed, the car is super cheap to run, and this is indeed one of its biggest strengths. It’s exempt from road tax and the London Congestion Charge, but replacing the battery with a new one will set you back £5,000. However, you can lease one and pay £70 + depending on mileage each month. The 24kWh can cover a range of 124 miles according to Nissan, while the 30kWh is good for 155 miles. Weather conditions will play a role in how far you manage to go, though, with colder weather potentially cutting that range in half. Your driving style will also affect the range. You can do a full charge for just £2, with Nissan forecasting that you shouldn’t need to fork out more than £260 a year in electricity on the Leaf Hatchback. However, public charging points do charge a network subscription fee. The car is fairly expensive to insure and occupies group 22. Basically, see above. This car is going to save you a small fortune. If you think it’s time that you and your family went green, the fact that this car emits no emissions at all makes it a very enticing prospect. If you want an ultra-relaxing journey all the time, the silence offered here is golden. 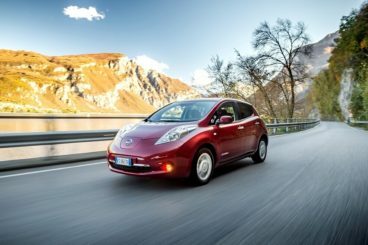 The Nissan Leaf 2016 depreciates worse than any other car on the mark at the moment and is expected to lose almost half of its original value in the first year alone. It’s certainly not the prettiest hatchback in the land. Six years ago, the Leaf looked edgy and innovative. Now it looks like something out of a Jetsons episode. Let’s see how it measures up against its rivals in the comparison section of our Nissan Leaf Hatchback review. Whether they’re crafting powerhouse executive saloons or compact electric city cars, BMW always make sure their vehicles are fun to drive – and the new i3 Hatchback is no exception. The car handles well, is fast, and is right at home in the town. It might look unlike any hatchback you’ve seen previously, but it drives just like one – an entertaining one, anyway! It offers good visibility, and while the suspension fails to soak up the odd bump, it’s mostly very comfortable. One criticism is the skinny tyres, which naturally offer a lot less grip than the hefty ones we’re used to from BMW. 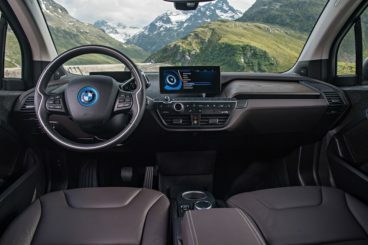 The nippy electric i3 is full of performance and can get you from a standstill to 62mph in just 7.3 seconds, which is much quicker than the Leaf. And incredibly, it actually feels even faster than those numbers would suggest because, like the Leaf, the i3’s power is available right away. The electric motor combined with a 0.65-litre petrol engine if you wish, although it would probably be more accurate to term it a generator. The hybrid combo is not as quick as the all-electric model, and it takes 8.1 seconds to cover the 0-62mph dash, which still makes it faster than the Leaf. The all-electric model is fast and also free from fuel costs, with a full battery recharge making a lot more monetary sense than regularly filling up a petrol or diesel tank. 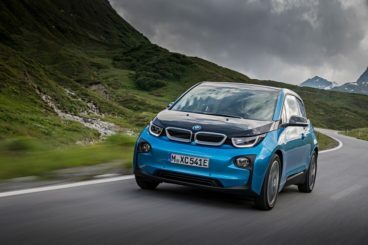 Meanwhile, BMW claims that their i3 REx can achieve average fuel economy returns of 470mpg. On the outside, the BMW i3 Hatchback looks a lot edgier and more futuristic than the Leaf. On the inside, it’s a similar story, with hi-tech screens in the dash helping to distinguish the car from a regular family hatchback. 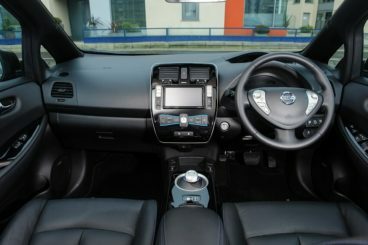 It’s easy to get comfortable, thanks to a height-adjustable driver’s seat, something which the Nissan doesn’t have, but the overall body shape of the car leaves it badly exposed to crosswinds whenever you traverse a bridge. The i3 might be really compact, but it’s also reasonably practical, thanks to some intelligent packaging on BMW’s part. Surfaces serve to give the cabin an airy feel, while head and legroom is good for average-sized adults, though taller ones might struggle. It’s a four-seater, with no seatbelt for fifth passengers. The boot measures 260-litres, which makes it over 100-litres smaller than the one in the Leaf. The Toyota Prius Hatchback has never really been a looker, and its style will continue to divide opinion. However, it’s practical, efficient and well-equipped. 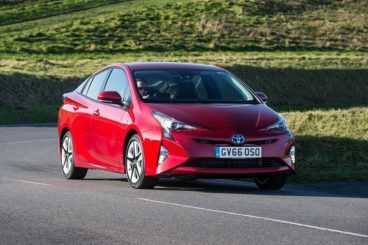 More competent than fun, the Prius combines a 71bhp electric motor with a 1.8-litre petrol engine that can deliver up to 97bhp. This results in a respectable 0-62mph sprint time of 10.6 seconds, which is competitive with the all-electric Leaf. There is also the option of a plug-in model, whose extra weight contributes to a 0-62mph time of 11.1 seconds. The hybrid offers good initial acceleration, but eventually, it tails off. It’s lighter and smoother than last time around, and you can keep going on just electric power for a bit longer. And when the petrol engine does kick in, there really is no hassle at all. In fact, you probably won’t even notice it. The plug-in Prius doesn’t need much fuel and has a top speed of 84mph. It’s not a barrel of laughs, but for a hatchback, it’s as competent as they come. The steering is responsive, and it’s stiffer than its predecessor. The new car is capable of returning fuel economy of 94.1mpg and is free from road tax, although you will have to pay a tiny amount towards the London Congestion Charge if you’re ever in the Big Smoke. For company car drivers, an 11% BiK should be appealing. The plug-in model, meanwhile, comes with an electric-only range of around thirty miles and average fuel economy returns of 282mpg. The cabin is clean, comfortable, and mostly of a high quality. As long as you overlook the basic model, you’ll get treated to plenty of soft-touch plastics, as well as a full-colour touchscreen that is easy to operate and very modern to look at. The layout of the interior is mostly intuitive, but there are a few niggling issues, such as heated seat controls behind the central fascia. You have to wonder why! The new Toyota Prius Hatchback is a lot more practical than last time and can boast more head and legroom, as well as a bigger boot. The fat windscreen pillar is still there, and this continues to cause a blind spot, but it is better. Getting in and out of the back seats is easy thanks to wide opening rear doors, storage space is very good, and the boot measures an impressive 343-litres. That’s still less space than you get in the Leaf, but it is folding the rear seats reveals a flat load bed, and the square shape is very accommodating. 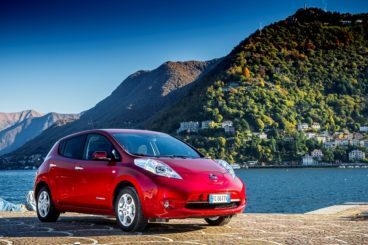 The Leaf has better rivals than it did when it first arrived back in 2010, but that doesn’t mean it should now be discounted. In 2016, it remains a solid alternative to petrol and diesel-based family cars, thanks to its 124-mile range, roomy interior and sizeable boot. You also won’t have to fork out on tax, London Congestion Charge or running costs. If you can overlook its poor resale values, the new Nissan Leaf Hatchback is a good choice for environmentally-conscious drivers who still want a quality family car. Looking For A Price For The Nissan Leaf Hatchback?